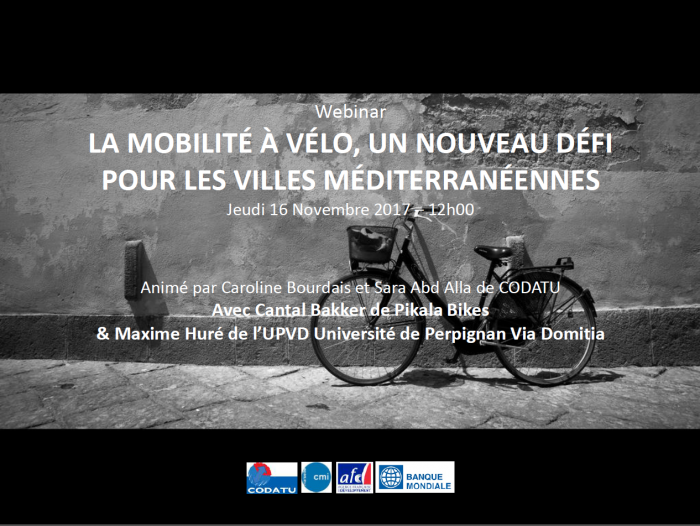 The webinar, jointly organized by CODATU and the CMI, took place on Thursday 16 November 2017 as part of the activities of the Community of Practice for Sustainable Urban Transport in the Mediterranean (CoP). With the aim of promoting collaborative learning and capacity building, the webinar presented on the one hand an ambitious initiative developed in Marrakech, and on the other the vision of an expert bringing elements of understanding over different models of shared bike systems. The listeners were able to attend the webinar by being connected online, in order to hear Cantal Bakker, coming from the Netherlands, and founder of the NGO Pikala Bikes developed in Morocco, and Maxime Huré, lecturer in political science at the UPVD, University of Perpignan Via Domitia, also researcher at the CDED (Center for Economic Law and Development) and associate researcher at the Triangle laboratory of Sciences Po Lyon, and President of the association VIGS (Innovative Cities and Knowledge Management), who published « Shared Mobilities. New Urban Capitalism » in 2017 at the Sorbonne Publications. During the first part of the webinar, Cantal Bakker first presented the activities and objectives of Pikala Bikes in Marrakech, and its ambition to change mentalities on cycling in Morocco. Her presentation was followed by Maxime Huré’s, on the different shared bike systems and their conditions of implementation. Both presentations highlighted the main obstacles encountered as well as the strategies put in place to overcome them. The second half hour was entirely dedicated to the questions of the listeners. Pikala Bikes is a non-profit association project which has been based in Marrakech for two years. It aims to encourage the use of cycling and create a community around cycling and the lifestyle that accompanies it. « Pikala », which means « bike » in Morocco, was chosen to name the initiative in order to ensure a good understanding by all Moroccans, as well as for the logo, which explicitly represents a cyclist to facilitate the identification of the association and its field of action by everyone, including by people who do not master reading. Through cycling, Pikala Bikes also works on employment, education, awareness of environmental issues, sustainable mobility, and health, and also encourages cultural exchanges through the Pikala Foundation in the Netherlands, as well as the development of eco-tourism, and the construction of new infrastructure with local authorities. Beyond the development of bicycle use, Pikala Bikes aims to participate in the sustainable improvement of the city and the quality of life of the inhabitants. Pikala Bikes has chosen the city of Marrakech for the launch of the initiative in Morocco, for all the ideal conditions that are there: a flat territory, suitable for effortless use of the bike, favorable weather on more than 300 days a year, and a specific configuration of the city center in the Medina, where only pedestrians and two-wheelers can circulate. In addition, mobility issues for which cycling could be an effective solution are numerous. Traffic is increasingly chaotic with a significant increase in the number of cars in Marrakech in recent years, and road safety poses real challenges, as are health problems due to air pollution. In addition, the public transport offer is still rare, while the city has 70,000 students who need transportation to get to university. Other Moroccan cities suffer from the same problems, and the ambition of Pikala Bikes through the initiative set up in Marrakech, is to serve as an example to cities such as Agadir, Casablanca or Rabat. Pikala Bikes acts first of all at the local level, with the mobilization of a local community where events and fun activities are organized around the bike, such as bike competitions, or creativity workshops for children, customization of bicycles. These activities are intended to raise awareness of the use of bicycles while attracting the curiosity of the inhabitants. Repair shops also allow trainees to train and learn new skills over periods of 6 months to 1 year. Pikala Bikes also conducts road safety workshops in schools, and activities to teach children the rules of the road. Bike classes are also available for women, who still consider that the use of bicycles is restricted to men. Finally, Pikala Bikes is running a club that offers weekly activities to raise awareness of environmental and health issues, as well as yoga workshops allowing an opening on the way of life that accompanies the use of the bike. With the aim of achieving financial independence after 3 years of activity, but also to finance the activities proposed locally to the inhabitants, Pikala Bikes is also involved in a range of commercial activities, with bike tours and bike rental service to some 2 to 3 million annual tourists who visit the city. In addition to these activities, which encourage the development of eco-tourism in Marrakech, Pikala Bikes is also developing a bicycle delivery service for small businesses and local governments, and the sale of bike accessories manufactured by local companies in Moroccan style (saddle covers, baskets and bicycle bells). Finally, Pikala Bikes is investing in a stronger relationship with local authorities, which can indeed set up infrastructures for cyclists in the city, but also raise awareness of environmental issues, and road safety, in coherence. with Morocco’s effort to become a greener country, especially since the holding of the COP22 in Marrakech in 2016. It is also with the local authorities that Pikala Bikes encourages the exchange of expertise with the Netherlands, for the construction of new infrastructures and the implementation of urban mobility policies. The urban contexts of Mediterranean cities are very varied. Also, with the four major models of organization of Bikes Shared systels that can be observed in the world, what model could be chosen for the Mediterranean cities? This is the most commonly implanted model. Public institutions use a large private company that is not necessarily specialized in bicycle originally, but often in street furniture and advertising displays, such as JCDecaux (Valencia, Seville, Marseille) and Clear Channel Outdoor (Barcelona, ??Perpignan). These large companies are indeed setting up the bike sharing system, most often in exchange for advertising revenue from the city. Also, the conditions of establishment of these companies and the choice of this model of organization, need to adapt to the constraints of the companies, with a territorial harmonization of the advertising markets in a coherent network, and to have a market advertising that generates enough revenue. In addition, it is better for the city to have beforehand significant cycling facilities, and to be part of a political approach to developing these infrastructures over several years. It is a model that can be observed in cities of different sizes, and for services of varying sizes. For example, there are around 6000 bikes spread over 200 stations in Barcelona, ? ?while Perpignan has about 200 bicycles spread over about 15 stations. This model represents a turnkey concept opportunity for local authorities, which delegate the entire service to a private company, without having to mobilize investment. But many failures are however to be deplored with Mediterranean cities which did not fulfill all the conditions necessary for the success of this model, in particular Rome, Perpignan, Aix en Provence, or Marseille. This model is particularly the one that has developed in Montpellier since 2008, with start-up Smoove, which has also been established in Paris since 2017, as well as in Madrid. The economic model of this system is not based on advertising but on a public service delegation. The communities pay in this second case, the true cost of the service. This model requires real expertise in VLS within the community, so that it can support start-ups that are sometimes recent, and thus participate in the revitalization of the local economy if the start-up is located on the territory. This model is for a private company, to bring in the city a fleet of bikes free to access and without constraints stations, with unlocking bikes by means of a smartphone application and a payment per half hour. This model is particularly developed in Chinese cities, with two main private operators Mobike and Ofo, but it is however often problematic, due to a lack of bike infrastructure and dedicated parking, which generates an increase in illegal parking and road safety issues, despite greater user ownership, and low community investment in service implementation. Some cities, especially in northern Europe, choose to do without a VLS system, because they do not have the use of it, or because they rely historically on the voluntary sector for develop the bike, as is the case in Strasbourg for example. In this case, it requires a public investment in support of associative actors, as for Pikala Bikes in Marrakech. The solutions are thus varied, and can be considered in coherence with the characteristics and specificities of the Mediterranean cities. L’enregistrement du Webinar La mobilité à vélo, nouveau défi pour les villes méditerranéennes est accessible en ligne (démarrage du webinar au niveau de la 17ème minute de l’enregistrement). L’Agence Française de Développement (AFD) agit depuis soixante-dix ans pour lutter contre la pauvreté et favoriser le développement dans les pays du Sud et dans l’Outre-mer. Au moyen de subventions, de prêts, de fonds de garantie ou de contrats de désendettement et de développement, elle finance des projets, des programmes et des études et accompagne ses partenaires du Sud dans le renforcement de leurs capacités. Les transports constituent un secteur d’intervention traditionnel de l’AFD. Sur la période 2001-2005, l’Agence a mobilisé environ 164 M€ par an en moyenne pour la mise en œuvre de projets dans le secteur des transports (en incluant les projets de développement rural et urbain comportant des activités de transport). banque mondiale (World Bank) est une source essentielle d’appui financier et technique pour les pays en développement du monde entier.